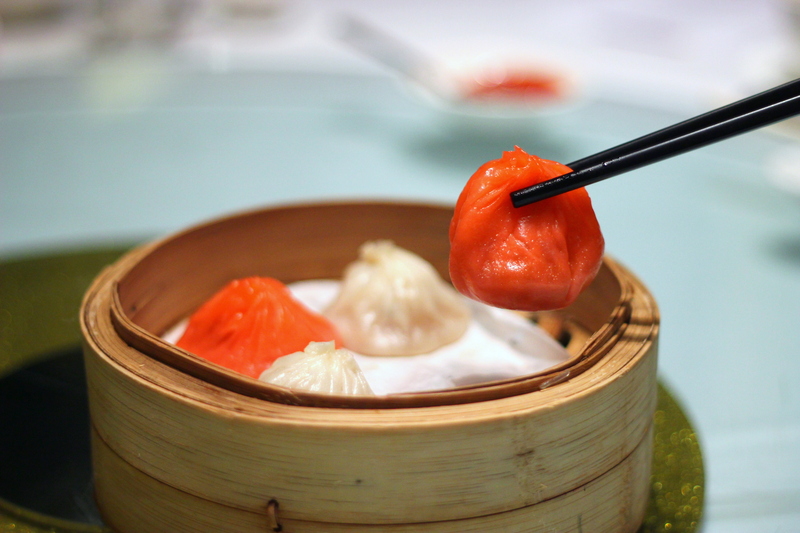 Available in Crystal Jade Jiang Nan and Crystal Jade La Mian Xiao Long Bao are the locally inspired Chilli Crab Xiao Long Bao and Hainanese Chicken Rice Xiao Long Bao, which are my favourites out of the lot. The vibrant red and off-white colours of the pairings struck the patriotic chord instantly, even before I tried it. We were divided over which flavour was better. The Chilli Crab Xiao Long Bao has a tinge of spiciness like the real deal with generous crab fillings, while the Hainanese Chicken Rice went so well with the ginger. Crystal Jade has already launched new dim sum at their Crystal Jade Palace Restaurant, Crystal Jade Golden Palace and Crystal Jade Dining In as you are reading this article! The irresistibly cute Chirpy Chips Pastry ($5.50/3 pieces) are filled with lotus paste fillings, which I find its texture too dry for my liking. That said, the intricate carving of the pastry will surely be a hit with kids. Even as adults, we struggled and were quite torn on sinking our teeth into these cute chips! My oh my. Another new, this Goldfish Crystal Dumplings ($5.50 for 3) are actually custard filled-dumplings! The Rantee actually mistaken this as a normal dim sum and dipped his in the sweet chilli sauce! You must have this, Fried Chilli Crab Bun ($5.50 for 3), put the chilli crab meats into the fried bun! Yes, you don’t have to dip your buns into the chilli crab gravy ever again! For this SG50 period (till 30th Sept), go try the local flavours xiaolongbao or head down to try the new dim sum at Crystal Jade! You get to have a complimentary new dim sum item with every order of two new dim sum items!